Just a couple of weeks ago the Prime Minister still seemed well set to win the large overall Commons majority she said she needed when she called the election. Although there were some signs of a modest Labour advance, she was still 17 points ahead, enough to give her an overall majority of at least a hundred. But over the past seven days, everything changed. Here are five things to take from the last week of polling. On average, nine polls conducted during the last seven days have put the Conservative lead at just 9 points. And while the polls disagree somewhat about just how close the election now is – the estimates have ranged from five points to 14 – every single pollster has identified a substantial narrowing of the Conservative lead. Two years ago, Mr Cameron had a lead of seven points and won an overall majority of just 12. Even that was only achieved by toppling many a Liberal Democrat MP and enjoying a bit of luck in marginal constituencies. So a nine point lead could mean that Theresa May would find herself left with a modest majority of no more than 30-40 seats. 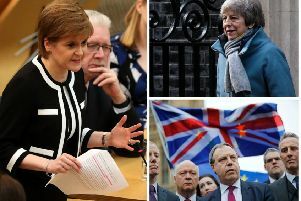 Meanwhile, the fact that no less than three polls – together with a separate mega polling exercise released by YouGov yesterday – have put the lead at less than seven points – means that these polls point to the possibility at least of the Prime Minister losing her majority entirely, with everything potentially depending on how many seats the Tories gain from the SNP and avoid losing to the Liberal Democrats. Certainly, between them the firm message of all the polls is that Mrs May is at risk of failing to secure her landslide and consequently could emerge from the election with her political authority weakened rather than strengthened. The advance in Labour support has been strongest above all amongst younger voters. Nearly two-thirds of 18-24 years olds now say they are going to vote Labour. So long, that is, that they do vote. Historically, younger people have always been less likely to vote. And one of the reasons why the polls overestimated Labour’s strength in 2015 was that they underestimated how may younger people would stay at home. Mrs May’s hopes of a large majority may now turn on how many of them make the same choice this time around. Many a poll has found that the advance in Conservative support is stronger in the North of England and the Midlands than further south. There are more Labour seats in the North and the Midlands than elsewhere, and so this pattern could deliver the Prime Minister extra vital seats. However, one of the apparent implications of YouGov’s pronouncement yesterday that statistical analysis of their mega poll pointed to a hung parliament is that the company thinks the electoral geography of the election may not work to the Conservatives’ advantage after all. John Curtice is Professor of Politics, Strathclyde University. This article first appeared on our sister site.